When I see a book with Jen Calonita's name on it, I know I'm in for some fun. I've read everything Jen has written and enjoyed them all. She's best known for her Secrets of My Hollywood Life series. I haven't loved her non SOMHL books quite as much, but they're all still fun. 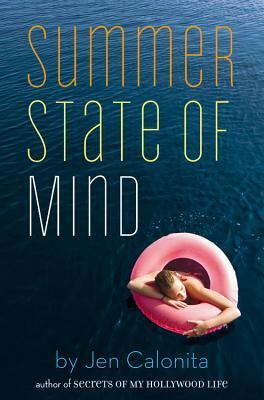 Summer State of Mind is a companion novel to Sleepaway Girls, which she published in 2009 - so it's been quite a few years. Don't worry if you haven't read Sleepaway Girls. I read it such a long time ago that I couldn't remember a thing. The only connection is that the main characters of that book are now senior counselors (college aged, I think). It's the type of companion novel where there's a few inside jokes, but nothing that keeps you from understanding the book. There was one reference I noticed to a character from SOMHL. I wish there'd been a few more. I really miss that series. I wish it got a spin-off. All of Jen's books are the fun, fluffy kind. The main character goes through some challenges and comes out a stronger person on the other side. There's always a little romance, but the emphasis is more on friendships and personal growth. It's predictable in the warm cookie and hot cup of tea on a chilly day kind of way. You get exactly what you want. In this book, Harper starts out as a stereotypical rich girl who is focused on her looks and on shopping. Her dad ships her off to summer camp to take her down a peg. And of course, summer camp is just what she needed, even if she didn't think so beforehand. Harper is a natural leader. She'd been dragged down by a mean-girl friend back home, so the true Harper was hidden. Here, once she learns to go with the flow, she stands out amongst the campers. There is some romance in this book with a sweet guy named Ethan. Imagine sailing off into the sunset. But mostly it's about friendship. She develops a strong friendship with a sporty, daredevil girl named Lina. She becomes much closer to her low-key, athletic twin brother Kyle. She wins over some of her reluctant roommates and has a great mentor in her counselor. I say these things not to spoil the book but to give you more of an idea of what a fun ride you're in for. There are a few plot-based surprises and a few times when I hid my face from the page, because I felt bad for Harper, but it largely follows the structure I wanted out of it. One thing that was a little odd was the timing of the book. The story took place over almost an entire summer. Often, days or weeks passed by within a few sentences. Overall, I liked the technique because I was able to get a full picture of Harper's camp stay without having to read 600 pages. On the downside, I sometimes felt like I was an outsider looking into the story - which is not what I look for in fluffy books. But as I said, I'm not sure how it could have been done better without it either being too long or too narrowly focused. My favorite Jen Calonita book characteristic is the fashion and culture. Jen's characters always have a great fashion sense and are up on the latest pop culture. They usually also have a lot of money, which means they wear designer clothes, have fancy vacations, and often know celebrities, whether real or made up. I like that the books don't denigrate being fashion conscious or make-up savvy (ironic considering I never wear make-up). Harper becomes more low-key and less vain as the book goes on, but her stylistic talents remain an important part of who she is and is even appreciated. I'm so glad that Jen decided to continue her Sleepaway Girls series, even if it has been five years. In fact, I think I liked this better than the original Sleepaway Girls novel. Harper was a joy to read about, as were Lina, Ethan, and Kyle. This book made me so sad that I never went away to summer camp. It's an armchair travel read of the best kind. Okay, another book and author I need to read a book from. I would buy this book for the cover alone--but this review definite cements it! I do love the fluffy books. They're perfect for after a long, crazy day or week. I like that this takes place over a summer and that you really get to know the characters within that time. Mud is right up there for replica handbags best overall flick of the year, but I need to see some hermes outlet of these other contenders before I can choose a top. I have to agree with Wolverine (less flaws than Thor). Gravity best? Hmm. Jury's still out fendi outlet on that one. Haven't seen American Hustle yet. But, yeah, it was awesome. Sandra should definitely get the Oscar. I'm on rolex submariner replica the bandwagon for Tom Hanks for Captain Phillips. If Leo beats him for Wolf I'll be pissed. Wolf blew chunks in my opinion gucci replica. If you want to watch an issue of Hustler with a pinch of story tossed in for good measure, then it's your piece o' pie. I found it filthy replica belts and utterly degrading. Was that movie even necessary? Hobbit II, IM3, MOS all letdowns. Elysium, Catching Fire, and Pacific Rim were quality popcorn, but I think prada replica more accolades for Oblivion are due. Loved that one. This article made me want to chanel outlet download. um. i mean purchase a copy of Stoker.